Letting go of your little one is one of the hardest first steps to take when you are a new parent. Sending them off to nursery leaves you full of apprehension and nerves as to whether they will fit in, whether they will enjoy themselves and how they will cope being surrounded by strangers for the first time. What makes it all harder is when your little one shows signs of not wanting to be separated from you; crying as you try to leave them at nursery is a typical example. But having a little anxiety about separating from your child, even for a short period of time, is completely normal. The bottom line is that it is important for both children and parents to spend a little bit of time apart. For parents, a much-needed break, time to work or time to spend with your other half is all very important. For the little ones, spending time away from mum and dad means they are learning independence and how to be sociable with other children and adults. Separation in small doses really is the best thing all around and managing the nerves that come with that is something we are very aware of at First Steps. We have a few helpful tips for overcoming these feelings of nervousness or anxiety when leaving your child at nursery for the day. When leaving your child at nursery, give them love and reassurance but don’t make a big fuss. Tell them that you will pick them up on time, give them a hug and then leave. Prolonging the goodbye process will heighten your child’s nerves as they feed off of yours. Keep it short and comforting then let the nursery staff handle the rest. Sometimes walking away from nursery after dropping your child off can leave you riddled with guilt, especially if they were upset upon your leaving. But just remember that this time apart is important and just ten minutes after you leave they are likely to be distracted by toys and new exciting friends. Instead, avoid feeling guilty and look forward to the end of the day when they will rush out to see you, smiling and ready to tell you all about their day. Once you have got into a solid routine for getting to nursery, saying goodbye and leaving, both you and your child will feel more at ease. Children need routine in order to feel safe and secure in their environment. The closer you can keep to a routine with nursery, the more nurtured and safe your child is likely to feel. At First Steps, we understand these feelings of anxiety when separating from your child for the first time. Some parents struggle more than others, but each of our nurseries has Facebook groups giving you live updates on what your child is up to during their day at nursery. This is just one of the ways we try to make your nursery experience with First Steps smooth and enjoyable. 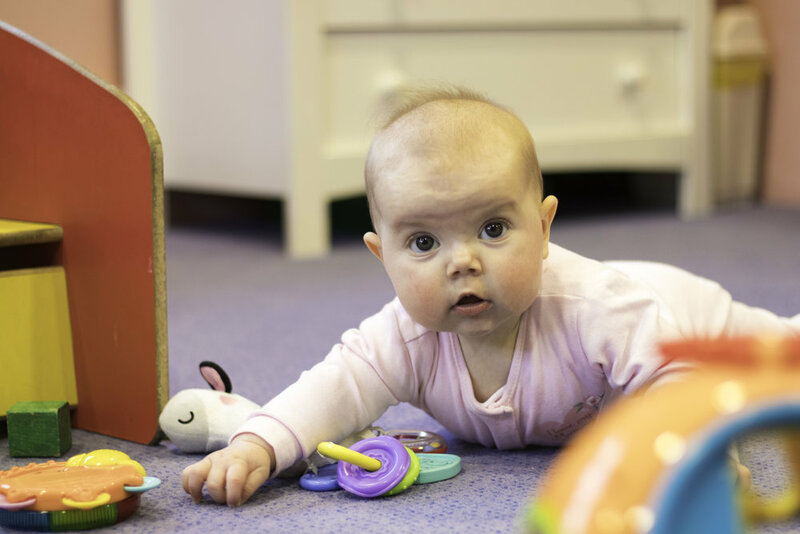 Our aim is to create a secure environment for all the children we care for whilst providing them with engaging and inspiring activities to keep them entertained throughout their time at First Steps. If you have thought about enrolling your child in a nursery, get in touch with your local First Steps Nursery.